I sat at a high table at Half Shell Oyster House in Destin, Florida. Christmas music played softly in the background, complemented by fir boughs adorned with red bows on each table. General Manager Stephen Vallette sat across from me as we discussed details of the Choctawhatchee Basin Alliance (CBA) oyster shell pickup at his restaurant. Soon the head chef came out of the kitchen, a large plate, full of oysters, balanced carefully on his raised hand. Setting it down in front of me, he explained each of the four styles: their award-winning Oyster Orleans, Charbroiled Oysters, Oysters Bienville and Oysters Rockefeller, complete with two pieces of garlic toast in the center. After taking photos of the dish from every conceivable angle, I dove in, my tiny fork ferrying each one of the flavorful morsels to my lips. 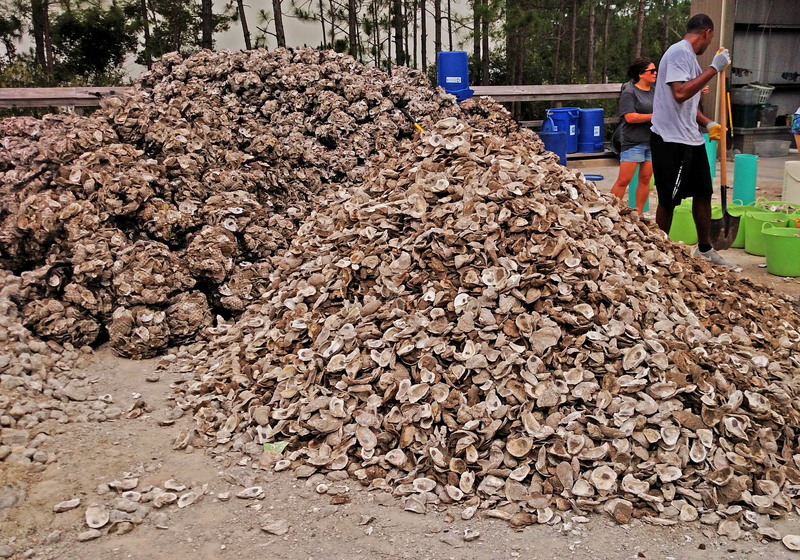 It all starts with an oyster shell.